Purchased this bar (and separately a matching 3T stem), partly to pimp my ride from the stock 'own brand' stem and FSA Gossamer Wing bars that I got on the bike (which actually were very similar in shape, but came in about 60g's heavier) and partly to narrow the bars from the stock 42" to a 40" which better suits my shoulder width. I wasn't expecting much to be fair as it wasn't a major upgrade, but I got what I was after...they're a bit lighter, they're bit narrower and they look better on my bike with the matching stem. I was hoping the top flat section might have been a bit flatter and wider than it is, but it isn't an issue...I wasn't prepared to spend x3 times as much for carbon bars on a winter/travel bike (and actually I wanted aluminium for the very reason) so I'm happy enough. Merlin delivery great as usual. Replaced a 42cm with this 40cm bar. Great shape with a flair so hoods are narrower than drops. 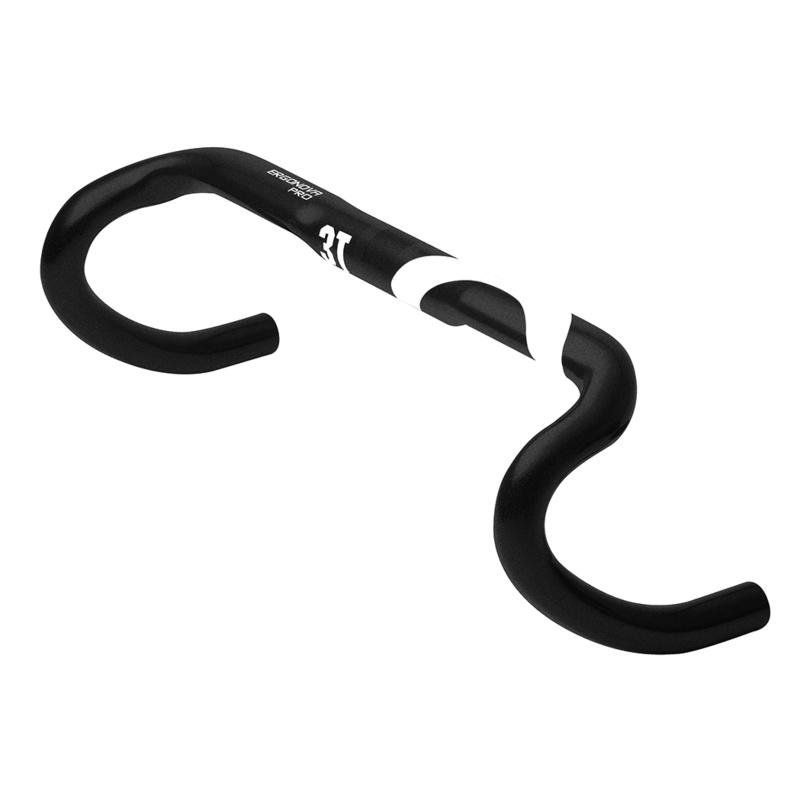 This shape and size keeps your elbows in tight, nice bars for sprinting and they also look great with Fizik 3mm tape on . Good purchase. Great Handlebar. I am 1.74cm and fits me perfectly. Super light vs my old PRO LT. Totally recommended for bike enthusiasts and not. Super fast delivery also from Merlin. Bought this bar for my cross bike. Love the slight flare, which makes bike handling on the drops easier and I stopped slamming my wrists on the bars while sprinting. I also enjoy the thicker top section of the bar. Worth every penny! Great bars, light enough for the price and they feel pretty stiff without being harsh, the wider tops are good for my CTS and have certainly helped reduce post ride buzz, look good too !! Saw these bars on a friends bike, sourced online and later purchased at a reduce price from Merlin Cycles. A very comfortable bar with a flattish top, also stiffer than my previous road bars, note the width is measured from the drops not the hoods, however I still ordered my usual 44 cm without any issues in comfort. I am very pleased with this product and an added bonus they colour coordinate with my specialised tarmac. Bars are lightweight and very good quality, been running 3T for a while now and I will never go back. Excellent bars. These are light and very comfortable handlebars with drops that are easy to get to and ride on. Brilliant bars. Much more comfortable and the pain in my wrist has gone completely. I like the look of this. It does seem a little shallow in the drops, but since it'll seat a little lower due to a lessened stack height, it works. Nice light comfortable bar at a great price from Merlin. Looks good too! Replaced the stock handlebars on my Genesis which I found were too narrow and I was getting numbness in my hands. These are a great improvement, allows me to ride on the tops and the hoods with much less pressure on my hands. Recommended. My main reason for choosing the 3TTT Ergonova handlebar was for its oval top section. Important for me. Riding on the tops over the bumpy ground, on my CX adventure bike with standard round section handlebars, an unexpected shock or thump could dislodge my grip causing loss of control and possibly a crash. An oval shape top section provides a much greater surface area to hold onto and grip, so is safer. It also results in more comfort for your hands on long all day rides. The shape reach and drop are all perfect for me, weighing in at thirty grammes less than my old 'bars, and not much more than the carbon model. I was prepared to pay a much higher price for what I wanted but found it all in the Ergonova anyway, including a good and friendly service. Thanks, Merlin. Six stars at the very least. Cracking set of bars - really comfy. Great balance of light weight and low price. I really like the flat portion of the bars - much more comfortable than standard round bars. Good, comfortable shape especially on the top flat part of the bars. Very comfortable in the drops. These bars look sleek and weigh little.